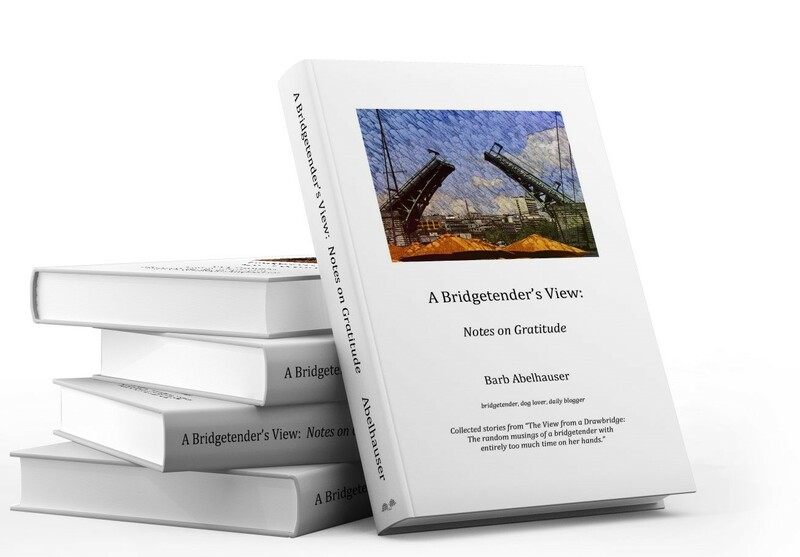 When I wrote my book, A Bridgetender’s View: Notes on Gratitude, I had hoped that it would be uplifting, and that it would help people to look at situations from a different angle and appreciate various aspects of their lives. I want to be a positive force in the world. I want to have left this world ever-so-slightly better than I found it. So imagine my delight when I discovered that my dear friend Amy Sassenberg, whose amazing photographs are included in the book, had been able to use it as a way to stimulate conversations and memories with people who are struggling with dementia. This actually brought tears to my eyes, because I can think of nothing more terrifying than losing one’s memories. So the thought that my book might be making a difference in that way, even if it’s just for a moment, means so much to me. It’s a rare occasion when I allow someone to be a “guest writer” on my blog, but what follows is Amy’s description of how my book, our book, has made an impact. If you know anyone who is a caregiver or has a family member who suffers from memory loss, please share this blog entry with them. It would be amazing if my book could make such an impact in ways I hadn’t anticipated. If you are able to use it in this way as well, please let me know. I’d be honored to hear about it. Recently I got the awesome opportunity to participate in the creation of Barb Abelhauser’s wonderful book, A Bridgetender’s View by adding some of my photographs to her excellent collection of contemplations on gratitude. It has been a pleasure and an honor to be associated with such a fine person and such a fine work. Of course I ordered a couple copies right away, and carried one around in my car in case I ran into friends I photographed who were in the book. I brought it to a senior center where I had captured a few friends having fun at a bingo game. (In addition to writing and photographing, I also spend time caregiving, volunteering and helping out with activities for seniors receiving memory care.) I read the excerpt nearest their photo and they seemed truly charmed and interested. Shortly thereafter I decided to share it with a client who was experiencing the decline into dementia. Her image was not in the book but she did like me to read to her. We had done this less and less recently because it was increasingly difficult for her to concentrate or follow a story. But she was sufficiently interested because I was involved, so I began reading the same passage about accomplishing goals well into old age. Her brow lifted and a smile came across her face. She then shared an anecdote about her elder sister. I read another entry, and again was met with smiles and the sharing of memories. We read several pages together as I asked her questions like, “Have you ever felt that way?” And she responded with enthusiasm and even asked me to re-read lines she especially liked. I brought the book to an adult family home and shared a few excerpts with clients there. Again it was a great conversation catalyst. I began bringing it with me whenever I would go into a caregiving situation, as well as visiting folks in the hospital. The entries are usually little more than a page long and so are easily followed, sometimes even by someone with memory lapses. Most have an uplifting message or lesson, which is also helpful when caring for someone with dementia because often there seems to be a tendency toward fear or frustration, which can easily lead to anger. I’m always looking for teaching tools or activities to share with my clients in memory care and to stimulate positive feelings and interaction. Sharing the book has been a fun, easy and beautiful experience, allowing me a new doorway to communication and a way for my clients and me to enjoy our times together. I can’t wait for the new edition.